A young alumna’s discovery in Yellowstone National Park is causing a stir far beyond its gates and has sobering implications for the future of the planet. 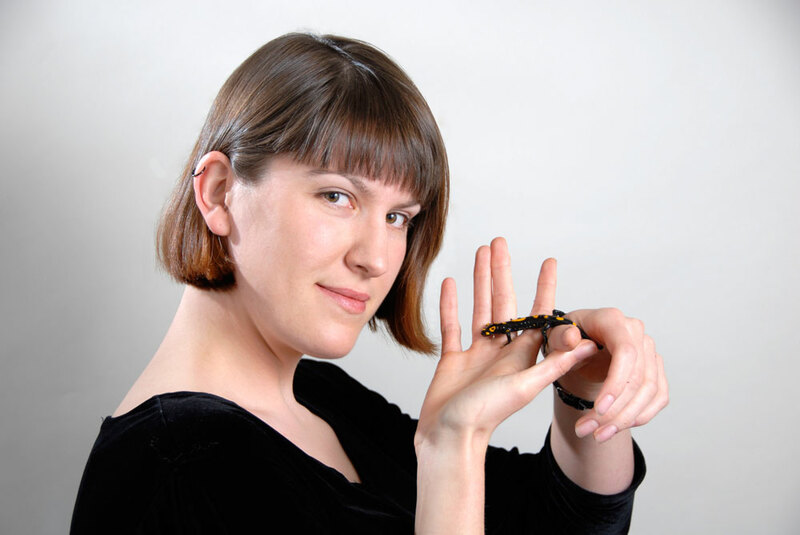 For nearly five years, Sarah McMenamin ’04 has been conducting research on a subspecies of tiger salamander, called Ambystomatigrinum, as part of her doctoral thesis at Stanford University. The salamanders are robust little creatures that have flourished for thousands of years in vernal pools and kettle ponds formed by glaciers. McMenamin was charged with comparing the salamander’s habitat and population to a survey conducted in 1992–93. 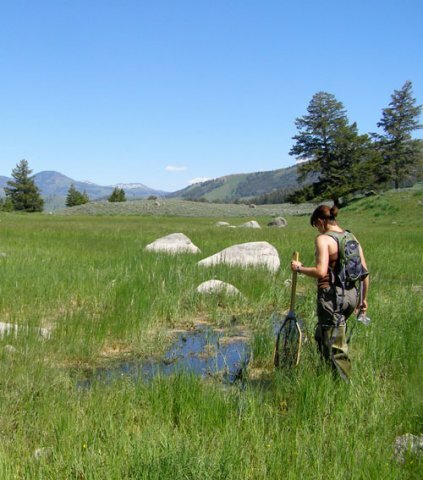 Guided by wetland sensing data prepared by survey coauthor Christopher Wright, she looked at an area of Yellowstone 10 km in radius that contained forty-nine ponds. What she found was alarming. In 1992–93, twenty-six of the forty-nine ponds contained amphibians. Now only fifteen did, a decline of nearly 50 percent. Moreover, the ponds themselves were disappearing. Because the ponds surveyed were not fed by streams or rivers and were refilled only by snow melt, rainfall, and the local aquifer, the animals’ decline could not be explained by the usual factors—such as wells, irrigation, or dams—that can draw down water tables and change habitat in less isolated areas. “The fact that we’re seeing this severe a decrease in an isolated area, in one of the best-protected areas in the country, which has minimal to no human development, implies that the effects of global warming are everywhere,” said McMenamin. McMenamin comes to her passion for science naturally. Father Mark is professor of geology and geography at MHC, and mother Dianna is a planetary geologist. The Cambrian explosion and evolutionary history were frequent topics around the dinner table as Sarah grew up, and she loved tagging along on her dad’s field trips. She spent a lot of time outdoors, frequently bringing home snakes and turtles. When McMenamin entered MHC, she recalls being certain “I did not want to go into science. That was what my parents did, and I wanted to strike out on my own in some creative, artistic field like writing or painting,” she said. But an introductory course in biology soon drew her in. “The biology department was extremely stimulating for a budding researcher, and … I was able to pursue research at a very early stage in my career. I was a TA for my adviser Jeff Knight and Craig Woodard for two semesters of their Genetics and Molecular Biology class, which was a fantastic experience,” she wrote in an e-mail. “I also spent two semesters doing independent research with [former faculty member] Diane Kelly.” Internships at the Howard Hughes undergraduate research training program at MHC in summer 2000 and at the NASA Ames Center in California in 2003 cemented her enthusiasm for research. Since October 2008, when McMenamin’s paper on amphibians in Yellowstone was published in the Proceedings of the National Academy of Sciences, she’s become a bit of a celebrity. Newspapers and Web sites picked up the story, and she has been interviewed by USA Today, the BBC, Discovery, Scientific American, and ABC, among others. Currently, McMenamin is collaborating with Pounds and Hadly on a chapter in an upcoming science publication and writing up her discovery of the “crystal” salamanders. And she successfully defended her doctoral thesis in May. 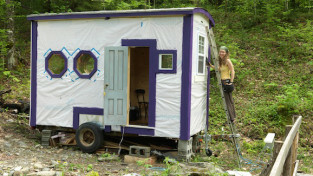 This article appeared in the summer 2009 issue of the Alumnae Quarterly. See the transparent “crystal” salamanders Sarah discovered! Thank you for serving. And thanks for writing about those who serve in our military. Its curious that Wellesley Alumnae Magazine did a similar article in their last issue. Exciting article to see science can be part of a community.